aside from the tan line that stops half-way down your neck, just above your knees and those little oval patches on the back of the hands, there's not always much to distinguish civilians from pure cyclists. well, that's not strictly true; there are all sorts of t-shirts, sweaters, jackets et al that can be worn on the outside, bearing cycling identifiable logos, characters and images. 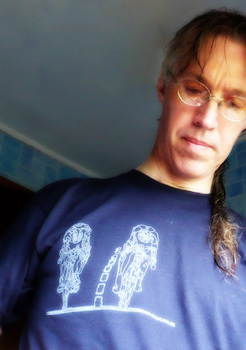 of course, there's not always a lot of crossover between one and the other, by which i mean there's not many of us who wear cycle jerseys in the office (well, some of us do), and oh so few items of the latter that you could happily wear on the bike without becoming a dripping mess in the corner. of course, there are always the exceptions that prove the rule, and panache cyclewear of boulder, colorado are at the early stages in the process of providing the cyclist of discretion with casual lifestyle wear that's practical, stylish and cotton. while cotton is often the material that our mums told us never to wear on the bike (honest - if you meet my mum, just ask her), this is different. panache have blended the cotton with a wicking fabric creating a thin, soft and very comfortable t-shirt with a novel outline sprint graphic on the right breast. so unlike most cotton tees, this one could be worn, as panache would have it "is perfect for a cruiser bike downtown to your favorite hang out." ok, this side of the pond, perhaps not too many of us own cruiser bikes, but you get the general idea. unfortunately, this side of the pond, cruiser bikes aren't all we don't have at the moment; panache are still in the process of setting up european distribution, but if this is a garment that you think would impress you as much as it impressed me, you can order direct from the panache website for only $29 (£16) plus the inevitable postage. now i need to have a word with ernesto about a cruiser bike. geoff thomas rode this year's london to paris ride, and much as i'd love to say we spent many a happy kilometre chatting about those things you chat about as you wend your merry way to the eiffel tower, i can't. 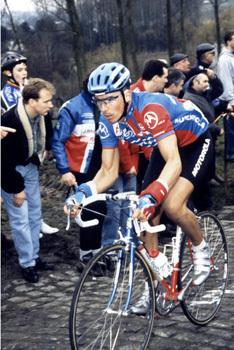 mainly because he was about three groups further up than me (that means he was a lot faster), and i think the only time i saw geoff was when we were amalagamating into the largest peloton ever to ride the champs elysees. and i didn't say anything then. on 3rd july 2003, geoff thomas, a former professional football player discovered he had chronic myeloid leukaemia - effectively, cancer of the blood. while the word fortunate is not one that can generally be used anywhere near the word cancer, thomas was marginally so, in that the disease had been caught in its early stages. what was even more fortunate (that word again) was that his sister turned out to be a matching donor for stem cells, allowing doctors to replace thomas's bone marrow with that of his sister. while such transplants are not always successful, due to occasional rejection by the new host of somebody elses stem cells, it worked for geoff thomas. as is the caustic side of any cancer, chemotherapy left a formerly fit footballer in a considerably reduced state. most of us would thank our lucky stars that all was as well as could be hoped for, and make plans for the best recovery possible. geoff thomas, however, felt the need to repay the doctors and nurses who cared for him, and the thousands of other leukaemia sufferers throughout the uk. so how would you go about raising a shed load of money for just such a charitable concern? ride the tour de france? i thought not, but that's exactly what thomas and his hearty band of supporters and fellow cyclists decided to do in july 2005, the same year another former cancer sufferer won his seventh tour in a row. naturally enough, you can't just tag along at the back of the professional peloton, particularly when you're likely to be one heck of a lot slower than they are, so the geoff thomas foundation peloton set off several days before the real tour de france and cycled every single stage; all 21 of them. admittedly this is not the first time just such an undertaking has been attempted. in fact riding through the storm mentions one other, that of paul howard, who rode the tour several hours ahead, rather than several days. however, such an undertaking by all those concerned is rarely done with so little real preparation. aside from the fact that thomas had only just come out the other side of probably one of the most devastating illnesses to affect anyone's life, he was only told he was in remission in january of 2005. this gave a confessed non-cyclist only six months to train for a ride of over 3000km; almost exactly the same amount of time i spent on training for london-paris, and not only is that a mere 600km, i'm perfectly healthy. i doubt many of us would have seen that as the first thing to try after a major illness. seated on bianchi bikes supplied by the famous italian marque for the duration, and supported by a small band of assistants in landrovers also supplied for the occasion, everyone made it through the pyrenees and the alps and all the way to the arc de triomphe by way of the champs elysees. under the circumstances, pedalling such a distance is hard enough, but this was not on closed roads such as enjoyed by the pros, and since the tour de france does not provide exact directions to other than the skoda lead cars in the real event, thomas and co. actually cycled the equivalent of one extra stage if you take into account the extra kilometres covered while getting lost. 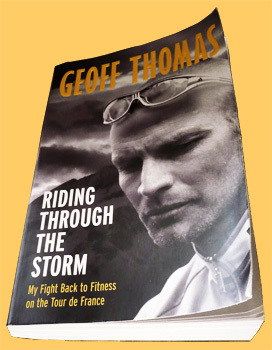 riding through the storm is based on the 2005 tour de france; each chapter heading refers to the daily stages of that year's event, but the narrative following doesn't always follow the same pattern. this is more of an autobiography, quite cleverly woven around the charity ride (nomenclature which almost sounds demeaning to such a daunting cycle), so some chapters concern thomas's previous life as a professional footballer. despite the fact that geoff doesn't know me from erik, i do hope he'll forgive that i pretty much skipped all the football stuff; it's a sport i have no time for at all, and the intricacies of which leave me cold. the latter exception aside, it's a well written book which should hold the interest of any intelligent reader, and a story that is well worth the telling. if one absolutely has to criticise, there are one two many repetitions regarding significant events in thomas's life, not least of which his diagnosis of leukaemia, and the eurosport commentator and champion of ireland is most definitely not sean yates. (i'm surprised this latter error made it from hardback to paperback). as a sort of postscript to this, geoff's fundraising continues apace; on november 2 this year, geoff will run the new york marathon, however, you may be interested in the unfortunates he has managed to recruit to join him, some of whom are going to need a lot of training time between now and novermber: sven thiele (london-paris), brian smith, anthony mccrossan, david harmon and allegedly, stephen roche. thankfully, when all this was arranged in the bar at the paris novotel, i had gone to bed. depending on how you buy your bicycles or frames will depend on whether the steerer length is a bit of a pain or not. complete bicycles from whichever manufacturer have already had the steerer cut to size and arriving either with, or without, any spacers to give a bit of flexibility on stem height. the old fashioned system that utilised a threaded steerer and adjustable height stem was just that bit more flexible, because if you bought a bike that was just a smidgeon too large or too small, the stem could still be moved up or down. if, like me, you bought frame and forks, there were those many hours (i kid you not) of measuring, fitting, staring, nail biting etc. before diving in with both hands, and lopping a bit off the top of the steerer, hoping that you'd not only cut it straight, but the correct length for head tube and headset. what, of course, i failed to take into account was the relative stack height of the campagnolo record headset fitted at point of initial build. would i be likely to fit a replacement headset in the years ahead that featured a wildly differing stack height and end up with a steerer that was too short? fortunately not, but more by luck than design. but what of the cutting procedure itself? 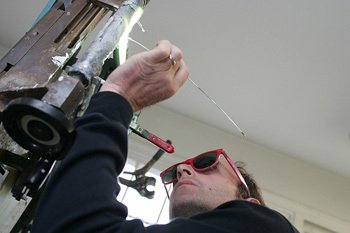 a hacksaw purchased from the local ironmongers may well cope with steel or aluminium steerers with ease, since that's sort of what hacksaws are designed to do. but are they the ideal tool with which to cut through carbon fibre? actually the very thought of cutting carbon is enough to give me the heebie jeebies, but in faced with a naked steerer that is too long in for the purpose (or frame) to hand, there is little option. perhaps unsurprisingly, it turns out that attacking carbon with a general purpose hacksaw is just as scary for the black stuff as it is for us. the clue is in the name - carbon fibre; steel and aluminium simply don't contain fibres that are going to be disturbed by a serated blade, while your friendly local colnago fork is made up of millions of the wee blighters. so those searingly clever chaps at effetto mariposo (purveyors of one of the finest torque wrenches on the planet), have had the bulb above their heads light up and produced a hacksaw specifically designed to slice through carbon fibre like a hot knife through butter: the carbocut. the secret? tungsten carbide. bonding a grit of the latter exceedingly hard material to a toothless blade means that, instead of cutting through the fibres with sharpened teeth (on the saw, before anyone tries it), the carbocut's blades grind their way through, reducing the risk of debonding any of the fibres, and providing a smooth finish that has no need of final sandpapering. normally, i would be one of the first to agree that specialist bicycle tools are for the specialist, particularly since many can approach the cost of a half-decent bike, but in this case, i'll happily make an exception. complete with one blade, the effetto mariposo carbocut retails at £34.95 with a five pack of spare blades at £29.95. since the blades are claimed to last a good deal longer than those on a standard hacksaw, there is no reason why the carbocut couldn't be used on other metals that could do with a slice removed. and let's face it, how cool would it be to casually mention that the black saw in the corner is for sawing carbon fibre. a handy degree of one-upmanship when that neighbour pops round to borrow the lawn mower. after waxing, probably less than lyrical yesterday, about the need to encourage youngsters to take up cycling for fun, fitness and possibly even competition, thewashingmachinepost makes an almost seemless transition into today's article by mentioning the braveheart fund. founded in 2003 by ex professional and twice british road champion, brian smith to aid young scottish riders with their future aims and aspirations, what the rest of us get out of it, is the annual ride and dinner on saturday 25th october. anyone with the fortitude and derring do can take part in the ride, which leaves from st joseph's academy in kilmarnock. entry to the ride can be be done online, as well as the ability to buy tickets for the evening dinner at the park hotel, also in kilmarnock. despite the latter being not quite our cup of tea, jez and i have capitulated to persuasion from messrs smith, mccrossan and harmon, and have our table already booked and paid for. while this might be seen as somewhat of a parochial announcement by those not lucky enough to live north of the border, there are more than a few riders from other parts of the uk who make the trip to ride with not only the assembled multitudes, but also with the celebrities in attendance. last year these included our dinner persuasion team, along with scott sunderland, sean kelly, sean yates and allan peiper (mind you, you'd have had to be shifting somewhat to keep up with those chaps) and it's a great day's riding that also benefits the fund. should you be thinking that the 72km ride might be a touch too much, there is also a 33km ride for the young and the faint of leg. we look forward to meeting several of those who participated in the ride of the falling rain, and hopefully folks we've not met before, all doing our small bit for the chris hoys, craig macleans and brian smiths of the future. if you haven't done anything else this year, why not cycle the braveheart ride? join us to see what mechanical failure brian smith can concoct to avoid riding too much of this year's route (i'm going to suffer for that remark). if you're not british, then the recent bout of olympic track cycling may not hold the same allure than it did for those of us that are. 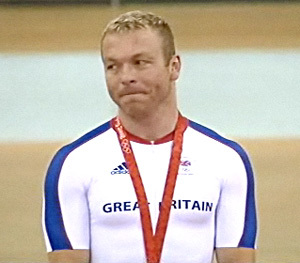 watching chris hoy win every single race that he entered is something that we probably won't forget about in a hurry. but the real surprises were the two youngsters, jason kenny and stephen burke, both of whom seem to have come from absolutely nowhere to world level while we were all looking the other way. with the 2012 olympics being held in london, the possibility exists that dave brailsford has a few more top class youngsters hidden away in one of those squirrel cupboards. but mr brailsford can't be everywhere nabbing all the young talent for team gb, or nurturing promising kids before they can even spell houvenaghel, and that's where we come in. i am making the perhaps not unnatural assumption, that those of you reading this article (other than the ones trying to cure insomnia) are cyclists who benefited from mum, dad or other relative having bought you even a cheap bike when you were knee high to bradley wiggins' toe straps. and for those involved in the competitive side of the sport, there is doubtless someone who helped along the way. so now it is our turn to be that someone. there are probably scores of youngsters all across the world who watched hoy, pendleton, kenny, burke et al and thought 'i'd like a piece of that', but they could probably do with a bit of a hand, either to get that cheap crappy bike running again, someone to explain what the heck is going on in the madison, or even the loan of a copy of heroes, villains and velodromes. some of us in velo club d'ardbeg, are attempting to do our bit, by starting port mor wheelers at the beginning of september, inviting kids of up to 16 years to come along and have fun on their bikes. we haven't actually noticed anyone around that looks like they might give chris a run for his money at the commonwealth games in 2014, but unless we start somewhere, we'll probably never know. none of us are experts at this; shane sutton need not fear for his job, but i think we'd know if someone was looking good and keen to improve. if that's the case, we can probably find someone with more knowledge and experience for a second opinion. maybe you could do something similar? team gb have started the ball rolling, so nobody will mind if we give it another push in the same direction. imperfection is perfection - an intimate look into the life and mind of framebuilder, richard sachs. a film by desmond horsfield. ...why would i? there are already a sizeable number of people who are far better at joining steel tubes than i'd ever be, so i'm sure the bike shed and the cycling world is a great deal safer in the knowledge that i'm sticking to wheels. fortunately, not all are as timid as i when it comes to mitreing tubes into lugs onto tubes, one of whom is currently in the rapha continental framebuilders feature, and who apparently has a waiting list as long as the output from the campagnolo chain factory. folks who have created this sort of aura (and waiting list) in this great big bicycle world that we inhabit will always engender a degree of admiration, but short of calling mr sachs on the phone to order one of his framesets, the likelihood of our gaining access to the inner sanctum are not particularly high. fortunately, desmond horsfield has carried out that part of the equation for us. imperfection is perfection is a thoroughly fascinating look inside the mind and the connecticut workshop of richard sachs (who has one of the cleverest and coolest logos/headbadges i've seen in many a long year). this isn't one of those 'here's how you you do it' type movies, though there are plenty of moments to admire the man's craft - dare we say 'art' - while the camera follows many aspects of his daily toil. sachs himself comes across as a very self-confident man (there are links to fifty articles, features and interviews on sachs' website); he states at one point that his customers don't just want his bikes, they want him. quite probably a truism; there are many other fine frame builders the world over, including those at witcomb cycles, london, where sachs trained in his early years to 'fill in time' while he waited to start college. but a lengthy (reputedly around five years) waiting list does rather prove that mr sachs is one of the favoured few. however, he comes across as a particularly honest, diligent and constantly thoughtful guy who is also highly opinionated. you need only watch the lengths to which he will go in the search for perfection in even the tiniest details on a richard sachs frame. who knew you could be that precise with a file? as a dvd, this is a gem. the filming, editing and sound are keenly produced, and while i know little about desmond horsfield, the end result truly seems to have been captured by someone who is just as fascinated with the subject matter as i am, and you will be. and continuing what seems a happy trend, the soundtrack is also particularly good. the documentary is somewhat short, running to only 28 plus minutes, but as someone who has never subscribed to the never mind the quality, feel the width dictum, the criteria really ought to be; 'does it say what needs to be said in the time it takes to say it?'. there can be little doubt that it does. the opening sequence is brilliant. the dvd can be purchased for $39.95 (about £21) directly from richard sachs website. order one immediately to see a master at work. maybe you'll want to join that waiting list. ...unless you're edinburgh city council. in which case, we might be in touch. congratulations to the entire british olympic cycle team; you have made us proud to be cyclists (and i still want to be chris hoy when i grow up). at least there is some sense of perspective from glasgow city council, who have announced that the new velodrome being constructed for the 2014 commonwealth games will be named in chris's honour. too flipping right! making not too much of a massive assumption, i would figure that many of you, like yours truly, have been either glued to the box or the web (and how vastly superior is the bbc's online experience against that of cycling.tv?) watching the track cycling from the olympics. 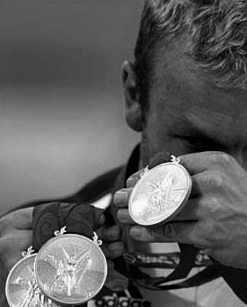 and i've decided that that's who i want to be when i grow up - chris hoy. one of the bbc commentators stated that hoy was probably the finest ambassador for british sport it is possible to have, and it's incredible that such a nice guy can cheerfully demolish all the opposition he's had so far at beijing. but it's not just been the cycling that's provided additions to britain's gold medal cupboard; rebecca adlington, a nineteen year old swimmer from mansfield nabbed two golds to raise the profile of britain's swimming prowess. and that's not all she managed; mansfield council were about to scrap the local swimming pool, but have now had a volte face and are to refurbish and rename the baths in her honour. and edinburgh council? well they're planning to honour chris hoy's superb performances not only at the olympics, but at the last world championships at machester, by demolishing meadowbank velodrome and erecting a new facility that pays no heed to cycling at all. 'if meadowbank hadn't existed, there is no question that i wouldn't be where i am today'. yes, there are plans to build a more modern, indoor velodrome in glasgow as part of the future commonwealth games facilities, but that is hardly the point. 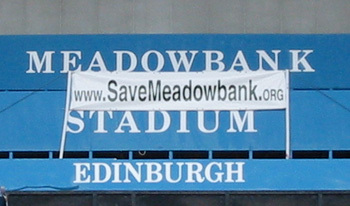 there really can be no finer tribute or testimony to the exploits of chris hoy than to spend a bit of cash on meadowbank and rename it the chris hoy stadium. of course, since politicians generally couldn't tell one end of a track bike from the other, the argument is seemingly falling on deaf ears, but there is a glimmer of hope in the form of an e-petition, hoping to exert at least some pressure where pressure needs to be exerted. so even if like me, you couldn't pedal a track bike if your life depended on it, and no matter whether you are a resident of north of the border or not, help scotland honour one of its finest ever sportsmen and sign the petition. because this is just plain wrong. many thanks to all those who entered last week's sportique competition. while every single entrant got the answer correct (25 percent shea butter), the first name drawn out the musette was that of mark silcox of farnborough, uk. your prize of a selection of sportique products should be with you in the fullness of time. and thanks to sportique for generously sponsoring the competition.